Najib’s New Year message reflects on the past year, unveils domestic agenda for 2015. Malaysian prime minister Najib Razak told citizens in his New Year message Wednesday that 2014 was the most challenging year of his career, with twin airline tragedies and record floods devastating the country. “This has been the most challenging year of my career – and one of the most difficult years in Malaysia’s history,” Najib wrote in a message that was published on his blog and in local newspapers. 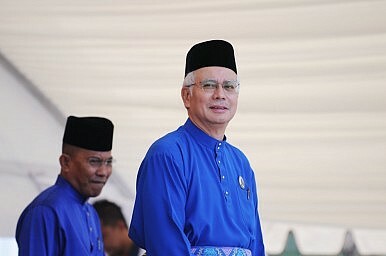 Najib, the son of Malaysia’s second prime minister and the nephew of its third, first ascended to a cabinet post in the late 1980s, going on to hold a number of portfolios, including minister of defense and education, before assuming office as prime minister in April 2009. Najib expressed his condolences to the families of those who lost loved ones in the disappearance of flight MH370 in March, whose search is now the longest in the history of modern aviation, and the downing of MH17 in July in Ukraine. “The disappearance of MH370, and the destruction of MH17, are part of our story now. My heart reaches out to those who lost loved ones; and I share their sorrow,” Najib said. Najib said that while the incidents were challenges for Malaysia, he was heartened by the way the country responded to them. In the case of MH370, Najib admitted that the Malaysian government “did not get everything right” in its response, which was roundly criticized for its lack of urgency, transparency and coordination. But he also praised Malaysia’s ability to bring together 26 nations in a search that spanned half the globe. And on MH17, which carried his step-grandmother, Najib praised the “quiet diplomacy” approach he had used to secure the return of the bodies and black boxes. Najib’s surprise deal with pro-Russian separatists in July was a diplomatic coup which won him praise at the time, including from members of the Malaysian opposition. “I am proud of the way we responded to these crises,” Najib argued. Najib also addressed the ongoing flood situation in Malaysia, which is the worst the country has seen in decades with nearly a quarter million people fleeing their homes. “We are used to floods in Malaysia. But I was shocked by how bad the situation became. The scale of destruction was profound, with so many people going through intense personal suffering,” Najib said. Although Najib was excoriated when reports surfaced of him golfing with U.S. President Barack Obama in Hawaii while the country was experiencing flooding, he assured Malaysians that his government’s priority now was assisting those affected. “The Government’s priority is to get help to people who need it now – with the supplies and assistance for those who are stranded or displaced – and financial support, so that people can get their lives back together,” Najib emphasized. Despite these tragedies, Najib reminded Malaysians that his government had recorded significant achievements in 2014 as well, primarily in the foreign policy realm by boosting ties with both the United States and China. China and Malaysia commemorated the 40th anniversary of their relationship this year (though it did not go as smoothly as both sides would have liked) while Malaysia and the United States forged a “comprehensive partnership” following Obama’s historic visit to Malaysia in May – the first by a U.S. president in nearly half a century. “Yet amidst the tragedies, there were high points too,” Najib said. Turning to 2015, Najib said the year would see Malaysia playing a much bigger role in world affairs since it would be chairing ASEAN as well as holding a non-permanent seat in the UN Security Council. He said it would give the country an opportunity to support issues it cared about, including regional integration and the welfare of the Palestinian people. “It is important that we continue to be a positive player, pushing the issues that we care about, and representing our people, our interests and our businesses. That is the only way we can ensure that Malaysian and South East Asian voices are heard,” Najib said. While these international obligations were important, Najib stressed that he would still be focused on building “a safer, more prosperous, and more equal society” at home. He outlined several key priorities for 2015, including combating terrorism, introducing a goods and services tax, and reducing inequality. “[D]espite all the global attention, my focus is on the rakyat,” Najib said, using the Malay word for people. The mysteries of the missing flight create doubts that will continue to plague the Najib government.